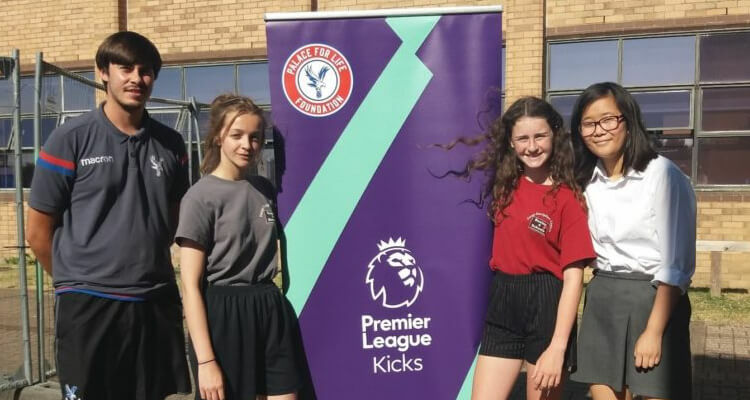 Talliah is 14 and has been attending Premier League Kicks Boxing sessions with Palace for Life Foundation at Harris Orpington since 2017. She has regularly attended the sessions, improving her skills and fitness, and has been involved most recently in volunteering and supporting in the delivery of the sessions to younger groups. We sat down with Talliah to discuss her experience and what her future holds. How long have you been involved in the boxing sessions? I actually started boxing in primary school when I was around 11 years old. I was struggling with listening and following instructions in class and was very close to the school expelling me. I found it very difficult to concentrate and focus. It was suggested that I attend the after-school boxing club in year six and this was the start of my journey. What have you learnt from being involved in the boxing sessions? One of the main areas that I have improved in is my discipline. In year seven I had really bad anger and again, like Primary School, this affected my school life. My grades were affected and I was close to being expelled. I have learnt to control my anger and channel that energy into the skills and fitness, as well as new boxing skills. I have also helped develop my coaching ability with young groups, and I’m now more confident to lead and take responsibilities. Have there been any changes in your school life? Year seven was tricky, I think being in a new school with new friends and teachers meant it took me a while to settle, but the boxing started to really interest me. Moving into year eight there were noticeable improvements; I was awarded most improved in a school assembly for dedication and my grades started to improve. You have recently taken on a role as volunteer at the sessions and also gained your first qualification, how has that been? I have been really enjoying volunteering. I am able to teach the younger students the skills I have learnt and help them improve. I start with a warm up using skipping ropes and some simple punch combinations. There have been some challenging students but I have been able to support them as I understand what I must have been like. Wayne [Talliah’s boxing coach] mentioned about the Sports Leaders Course and I was really excited to be given the opportunity to gain a qualification. I was a little nervous at first but after the first day I was excited for day two. Have you been able to use any of the skills from the course? Yes, my PE teacher allowed me to run a warm up and fitness circuit to a class of 30 year nine girls. I think if I hadn’t been on the course I would have been nervous but I wasn’t and felt confident. There were some students that didn’t listen, so I used my experiences from the Leaders Course and previous sessions to get them to focus, which the teacher was very impressed with. I will be looking to take a BTEC in sports in year 10 and my long-term ambition is to box professionally and continue to progress in coaching. I have already expressed interest in the Level 2 Sports Leaders Course and I would like to gain more specific boxing qualifications when I’m older. Check out our boxing class and find out how it can help channel energy in inspirational ways.